palmOne is promoting the various Palm software available to track your diet and exercise using your handheld device. If you have resolved to keep close tabs on your food and diet regime, the following products may help you. palmOne Resolutions: They include information about the Atkins Carb Counter, Diet & Exercise Assistant 6.0 and Weight Watchers On-The-Go. Quackwatch has a copy of the FDA warning letter sent to Window Rock Enterprises, the company that produces CortiSlim. The FDA doesn’t think CortiSlim will supress your appetite, reduce your cravings, or burn calories more efficiently and naturally through thermogenesis. Do you think you should spend your money on it? I am hosting a workout on Xbox Live tomorrow, Thursday December 30th at 7am Eastern (4am Pacific). If you would like to join us, we will be working out with Dance Dance Revolution Ultramix 2 for a little over 30 minutes. We are playing on Light Mode, so if you’re a beginner, you should be able to keep up. I am going to start with some easy songs, spend some time stretching, work on harder songs and then cool down with some more easy songs and stretching. Feel free to join us for a fun workout, even if it’s early for you. We’re a pretty welcoming crowd. It’s about the exercise. No matter how many greats or goods you get, you win if you’re playing. Prevention Magazine has an article in this monthâ€™s issue called â€œFind the Right Gym for You.â€ On page three of this article, they address my biggest issue: â€œI find the gym intimidating.â€ Do you want to know their solution to my problem? My friend is doing a cleanse. She’s blogging about it and I want to link to her. 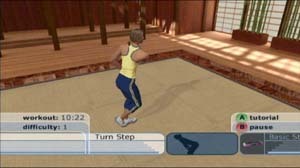 Games for Health is a website that looked like it would be interesting to me. They just received funding for The Serious Games Initiative to encourage the creation of games that promote good health. Sounds like something that I would think was cool, right? The idea that Christmas comes once a year is a common excuse to binge. The thought, â€œThis is my only chance to eat this,â€ is the precursor to many a broken promise to myself. Not this year. I have finally realized that itâ€™s not true. If you are eating a healthy diet and following the USDA’s food pyramid, do you need to take a vitamin and mineral supplement? Some organizations say you should, while others say you don’t need to. Who is right? Is it better to just take one “just in case?” The following article is a very detailed examination of the issue. This article is provided by the Ortogo Healthy Lifestyle website (a vitamin supplement company), so the information may be weighted toward the use of vitamins. The information provided, however, states the recommendations from many health organizations and is a good basis for information on the issues.